Last month, I featured a recipe swap with carrots as the featured vegetable. Thanks so much for sharing your recipes. Read that post here: Our First Recipe Swap Featuring Carrots & My Favorite Pickled Carrots. This month, I am hoping we can share cauliflower recipes. I am planning cabbage for March, and I have selected asparagus for April. I can’t wait until April! Cauliflower is one of the foods that you should eat if you can figure out how to cook it. One of it’s most difficult attributes is that it is bland, so you have to figure out how to season it. This recipe has a whopping 175% of your daily value of vitamin C and it is very high in vitamin B6. You can't go wrong eating cauliflower. A reader sent me the suggestion for the recipe below. I had seen some other food blogs before the Super Bowl suggest making crunchy cauliflower with Buffalo wing sauce, but I didn’t get around to trying it. You know, I think this works as long as you forget about the deep fried chicken that the sauce is usually served with. I did find that I liked it without the sauce better than with it, and I served it with a dash of Kosher salt. Be very careful with Frank’s Red Hot. Not only is it spicy but there is 340 mg of sodium in one tablespoon. I drizzled it rather than soaking the cauliflower in it. Please share your favorite cauliflower recipes with all of us. Heat oven to 425 F. Line a rimmed baking sheet with parchment paper. Core cauliflower and cut into small florets. Beat egg whites with a fork until frothy. 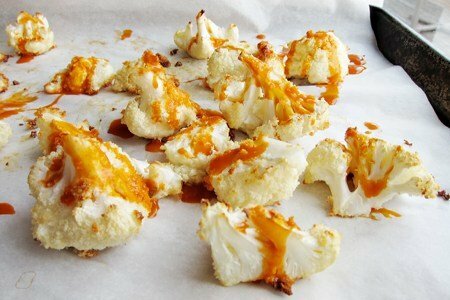 Mix egg whites and cauliflower in a bowl until the cauliflower is coated. Add panko and mix until cauliflower is coated with bread crumbs. Bake for 20 minutes or until cauliflower is crispy. Drizzle on Frank’s Red Hot Sauce and serve. You know, I like cauliflower's taste, esp with butter s/p, sometimes cut small or sometimes mashed. My hesitation to serve it more often is the color; I like a colorful attractive plate of food, it excites my eyes first then my tastebuds and gives me a mental satisfaction. I also don't serve white potatoes often for the same reason [unless they're swimming in brown gravy or stuffed with broccoli, etc. :) ]. I like the idea of using cauliflower as a snack, a dipper, and I will give buffalo sauce a try! It's colorful! I hope to learn about other recipes today too. Thanks again SG! Had this and love it. I shared this once, but we make whipped cauliflowr instead of mashed potatos! Blend it with a habd blender in the water tht its boiled in, ans add either/or: s/p, esp some hot sauce, & even some balsamic vinegar&cayane! Does Cauliflower pizza crust count as a way I like to eat cauliflower? 2 cups cauliflower, 1 egg, 1 cup shredded cheese and some italian seasonings...I didn't really even need the veggie toppings on the pizza. So delish! (1) http://www.acouplecooks.com/2011/11/roasted-cauliflower-with-apple-and-dill/ - original recipe includes some currants as well. (3) saute an onion, add optional mushrooms and garlic if you like, then add "riced cauliflower" - you can find basic instructions on the internet - black pepper and 1-2 tsp. curry powder. Cover and cook for 10-20 minutes. For extra creamy goodness stir in a wedge of light Laughing Cow to each individual serving. Be creative! Hi, lurker here try http://www.damyhealth.com/category/cauliflower-recipes/. She is super inventive with cauliflower. Pizza bites are divine. Love your blog. try roasted in the oven with some smokey paprika on it. My favorite vegetable!!! Love all the above but you can't beat roasted! just plain or spray with a little pam and sprinkle with your favorite spice. i like onion powder as i can't have too much salt. I love "slicing" it in steak like slices, about 3/4 inch, and lightly brushing with a olive oil and balsamic blend with freshly ground salt and pepper and let it cook along with my meat of choice, on my gas grill. I've always hated cauliflower. It was also too bland and had a strange texture. I had only ever tried it using the same three cooking methods: boiled, fried, or steamed. But within the past month, this has become my favorite vegatable. About three weeks ago I finally tried roasting cauliflower and this gives it a whole new flavor. I put chunks of raw cauliflower and a bunch of chopped fresh garlic tossed with a bit of olive or coconut oil, a bit of salt, on parchment paper lined pan and roast in 425 degree oven until golden brown. It is so good the first day - but for some reason it loses a bit of its' wonderfulness after it has been refrigerated. Warning, do not let yourself eat the whole panful in one day - I paid for my gluttony for about a week. love whipped also. sometimes i pretend it's grits for shrimp and grits. also have used it as a dip for other veggies. I always use the following and its delicious and keeps for a few days. Heat oven to 450 degrees F. Combine cauliflower and garlic in a large bowl. Drizzle with olive oil, lemon juice, salt and pepper. Transfer, in a single layer, to a large rimmed baking sheet. Roast at 450 degrees F for about 25 minutes, stirring once. Sprinkle with cheese. Serve immediately Yield: 6 servings. To those like me bothered by the color (or lack of) of cauliflower, I highly recommend using it in Indian food like curry - the tumeric gives it a yellow color that is far more appetizing, and it absorbs flavor nicely - sort of like potatoes, which it's often paired with. And please check out Joe's wonderfully heartfelt documentary, "Fat, Sick and Nearly Dead," available on DVD and to watch for free at hulu.com. P.S. I'm in no way affiliated with Reboot Your Life; I'm simply grateful for all of the sound, helpful information the site offers and want to pass it along so that others may benefit.